Patiently waiting in line... is this a specifically Swedish virtue? 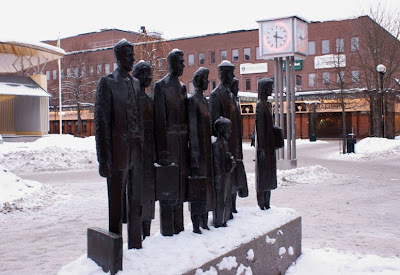 Thomas Qvarsebo created the bronze sculpture Resenärer ("Travellers") in Hässelby gård. First I thought you were referring to the snow, then to the somewhat gloomy artwork and finally (?) I realized that you were thinking about the hobby of waiting in line... This morning's good laugh!